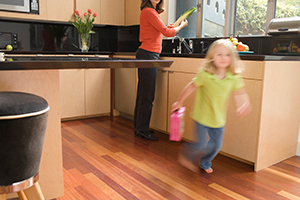 Insist on quality PureBond® veneer core hardwood plywood in your cabinets, furniture and closet systems. PureBond veneer core plywood is all wood—no particleboard—and it’s made right here in North America with Columbia Forest Products’ EPA award-winning PureBond formaldehyde-free technology. You’ll enjoy the enduring beauty of real North American hardwood that will last for generations and is a healthier alternative to wood products that use urea formaldehyde in their construction. So now you can breathe easier – because your PureBond Fabricator Network member can explain the ways they can build your cabinets or furniture with your home’s beauty – and your family’s peace of mind. The timeless warmth of wood … with the design versatility to convey traditional, classic or contemporary looks. Available in countless real-wood veneer surface options. Hardwood strength, performance and durability. Environmentally friendly, proprietary, soy-based technology with no added formaldehyde. Enhance the resale value of your home. PureBond cabinetry is a great selling feature and differentiator. Made in the US and Canada, PureBond is cost competitive, yet delivers so much more in quality. Interested in learning more about PureBond plywood and its quality? View our brochure, or feel free to contact us today.